John Hoyland RA‘s prints encapsulate the verve and poetry of his paintings. Hailed as the leading abstract artist of his generation, Hoyland’s work is poetic (every piece has meaningful and lyrical name) and pasionate. Born in 1934 in Sheffield, John Hoyland studied at the Sheffield School of Art (1951-56) and then the Royal Academy (1956-60) and went on to teach at the Slade and Royal Acdemy art Schools. Hoyland’s artistic development in the 1960s ran parallel with the Abstract Expressionists in America. Hoyland was interested in their work and ethos, moving to New York in 1964. In London he had had a series of one man shows in a variety of well known galleries including the Whitechapel and Waddington. John Hoyland’s prints like his canvases are rich in colour and bold in composition. Though they may appear spontaneous, much preparation and thought is given to the balance of colour and form. For every colour in the print a seperate stencil is created through which paint is pushed; gradually building up layers to complete the image- necessitating a great deal of forethought. The compositions generally focus on a central cell-like element; this gives the work a definitive structure and focus as well suggesting a biological/natural/stellar form. John Hoyland’s first solo show took place at the Marlborough New London Gallery in 1964. This was followed by a series of national and international solo exhibitions, including the Whitechapel Gallery, London. He showcased his work at the Waddington Galleries throughout the 1970s and 1980s; and a retrospective of his work was held at the Serpentine Gallery in 1979 and again in 1999 in the Sackler Galleries. Hoyland’s work has also been included in numerous international group exhibitions from 1964, when his work was selected for the New Generation exhibition at the Whitechapel Gallery, London. More recently he had participated in group exhibitions at the Tate Gallery, Liverpool and the Barbican Gallery, London in 1993, and at Galerie Josine Bokhoven in Amsterdam in 1994. 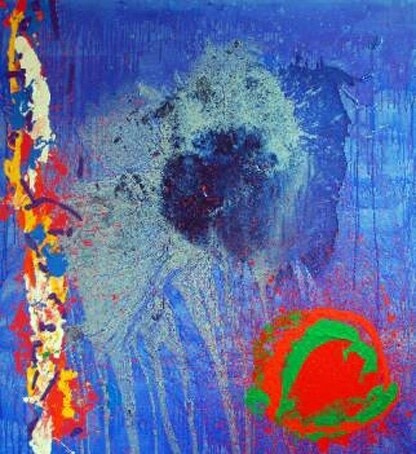 John Hoyland has received many awards throughout his career, including the Calouste Gulbenkian Foundation Purchase Award; a Peter Stuyvesant travel bursary; he was a Prize Winner at the John Moore’s Liverpool Exhibition in 1964 and won First Prize in 1982; he received an Arts Council purchase award; joint first prize with William Scott in the Korn Ferry International and first prize of the Athena Art Award in 1987. In 1998 he won the Wollaston Award for the most distinguished work in the Royal Academy Summer Exhibition.